Menswear loves a good buzzword, doesn’t it? Sprezzatura, Americana, sports luxe, timelessness, business-casual, essentials, capsule wardrobe, versatility… the list is endless. Many of them will inevitably be forgotten as soon as the trend they’re tied to falls out of favour, while others are now firmly entrenched within the industry. Today’s topic focuses on the last word of the list above: versatility. A crucial part of any well-curated wardrobe, investing in staples that are able to adapt to both casual and formal scenarios not only increases your outfit options for any given event, but also helps keep your expenditure to a minimum. Denim, in all forms, has rightly cemented its place within menswear. Currently dominating industry hot lists, the fabric was extremely prominent within AW14 and SS15 collections – yet we all know that denim is much more than a flash in the pan trend. Although typically considered a casual material, over recent years denim pieces have gradually crossed over into the smarter side of our wardrobes. Slim-fitting jeans are now regularly being paired with blazers, while the denim jacket has become a viable alternative to formal styles for dress-down Friday in the office. 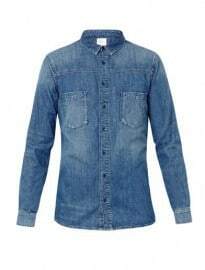 The denim shirt is the latest piece to experience a notable rise in popularity, with many men now considering it a modern wardrobe essential due to its versatility. No longer the reserve of the workerwear scene, this masculine option is being dressed up by sartorially-inclined gents across the world. In fact, today, you are just as likely to see it supporting a suit and tie as you would a shacket and heavy duty boots combination. However, in order to get the most from your denim shirt, you need to get the style right. Look for slim-cut, button-down versions in dark blue and indigo washes for the best results – they can be dressed up or down with ease, bringing a rugged, tactile touch to traditionally smart aesthetics while taking casual ensembles up a notch due to their clean lines and fitted appearance. Below we’re going to take the exact same denim shirt and demonstrate how it can be used for both on- and off-duty occasions. We’ll begin with the dressed-down look. Forget all preconceptions and past style sins, double denim has become a styling technique that all men should have in their repertoire. This look is extremely easy to pull off, so long as you remember the golden rule: differ your washes. Here we contrast the blue wash shirt with some dark black jeans. The premise of a capsule wardrobe is that it can adapt to any scenario or occasion. Here we prove the denim shirt deserves a spot in your collection by dressing it up with some sharp tailoring for the office. Start by combining it with a suit in this season’s key material trend, grey flannel, and knitted tie – the burgundy version below complements the shirt both in colour and texture. As the menswear industry took off, checked shirts went through a period where they were considered the ultimate men’s style overload. You couldn’t move on the high street without spotting one and sadly that level of saturation eventually saw them fall out of favour with many discerning gents. Yet over recent years their popularity has waned slightly and it seems the check shirt is now ready to stage its comeback, tying in nicely with AW14’s big check/tartan trend. Those made of autumn/winter-appropriate materials are particularly worthy of consideration, with the flannel check shirt recently highlighted as one of FashionBeans’ five key pieces for the new season. There’s a wealth of styles available on the current market, at all price points. Check has become a blanket term for everything from buffalo plaid to tartan, but if you’re looking for the ultimate in versatility, you will never go wrong with a classic gingham shirt. Closely linked with mod style, it can be dressed up with tailored separates or down with a parka and jeans at the weekend. The checked shirt is a style chameleon – it can be seamlessly integrated into an array of different aesthetics, from preppy to punk. For this casual look we style the check shirt in a more current, contemporary way by combining it with a leather biker and some slip-on trainers. Indigo wash jeans anchor the ensemble and allow the luxe leather to take centre stage, while the vintage Black Watch tartan print provides the all-important detailing and personality. Reinforcing its versatility, the same checked shirt could actually be worn to the office, if your dress code is slightly more relaxed. Take a tactile approach to your tailoring by favouring heavyweight, seasonally-appropriate fabrics. Here, a tweed blazer and woollen trousers combination ensures you appear sharp and sophisticated, bringing a British heritage edge to your classic tartan shirt. By far the least common of our three shirting picks, the overshirt isn’t something many would even consider when looking to expand their autumn/winter options. A cross between a shirt and jacket, it retains the classic shirt silhouette but is often made from thicker, warmer materials and usually comes lined. Quilted takes have also come to the fore due to the technical fabric trending for AW14. The overshirt comes into its own during milder autumn days, where it can operate as a temporary jacket, yet it makes a great layering piece as temperatures continue to drop through winter. Just make sure you stick to slimmer, tailored versions in order to really harness its versatility. The overshirt is set to become your new go-to piece this season. Its ability to operate as a top or middle layer will be invaluable as the weather worsens, with the art of layering vital to overcoming the elements. Shore up your off-duty ensembles by slotting the overshirt in-between your outerwear and middle layer – in this case it’s a timeless pea coat and on-trend roll neck pairing. The overshirt can just as easily be integrated into your smarter getups. In this look, we’re dressing it up by opting for the shirt-come-jacket over a blazer. Underneath, team a non-matching trousers and waistcoat combination with an Oxford button-down and textured plaid tie. The capsule wardrobe concept is one that we here at FashionBeans continue to champion – and the three shirts showcased above fit into this philosophy seamlessly. Being able to dress an item up or down makes it a huge wardrobe asset, providing you with a wealth of styling options and saving you money in the process.